Regulation of the immune system is fundamental to protecting the host from infection whilst constraining autoimmunity, undesirable inflammation and immunopathology. 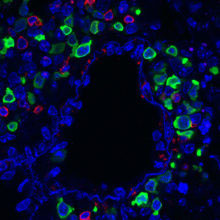 Immune dysregulation can lead to diseases such as asthma and allergy (Figure 1), autoimmunity and leukaemia. Using techniques including mouse genetics, fluorescence imaging and gene expression analysis we discovered group 2 innate lymphoid cells (ILC2s) as significant new participants in immune regulation through their cytokine secretion (Figure 2). We now know that ILC2s belong to a larger family of ILCs that develop from lymphoid precursors that also give rise to the T and B cell lineages. We aim to identify the transcriptional pathways that regulate this differentiation and gain molecular insight into cell commitment. ILC2s localise predominantly at mucosal surfaces where they act as critical sentinels for tissue damage and infection, at the interface of innate and adaptive immunity. Our goal is to determine the cellular and molecular pathways that regulate ILCs during homeostasis and disease, and how they might be targeted therapeutically in humans. Figure 1. 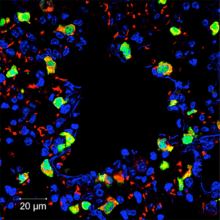 Expression of the ILC2-stimulating cytokine interleukin-33 (green) by pneumocytes (red/yellow) in allergen-challenged lung. Cell nuclei are blue. TH 2 cell development and function. Nat Rev Immunol. 18(2): 121-133. Innate Lymphoid Cells: a new paradigm in immunology. Bcl11b is essential for type-2 innate lymphoid cell development. J. Exp. Med. 12(6): 875-882. MHCII-mediated dialogue between ILC2 and CD4+ T cells Potentiates Type-2 Immunity and Promotes Parasitic Helminth Expulsion.